Heals. We are focused on placing you on a healing path. We will thoughtfully listen to you, encouraging you to share and talk about your loved one. Throughout our time with you and your family, we will be a guiding hand helping you make the right choices. 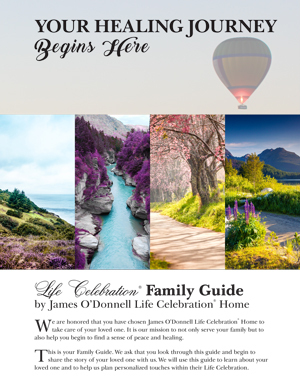 We also have healing tools such as our family guide that will help you begin to walk back down the path of your loved one’s life. Working together, we will co-create a unique and memorable experience that will help you reminisce and celebrate the life of your loved one. Comforts. You will feel the warmth from our staff as soon as you walk through our doors. We are here to serve you and help you through this very difficult time. We are a family-owned business and you will see the care and comfort of families is at the forefront of what we do. We provide a relaxed environment and our facility is beautifully decorated and welcoming. Remembers. Our focus is on providing you and your family, friends, and guests a healing and personalized experience. We create an atmosphere that encourages sharing memories, telling stories, and celebrating the life that was lived. Remembering the good times and walking back down the path of your loved one’s life will help you heal. Let us help you remember. We promise to honor, remember, and celebrate every life that comes into our care. We understand that no two people are the same and from our first interactions with your family, we want to begin learning about the uniqueness of your loved one. One way we begin to co-create is by giving you a healing tool called the Family Guide. The guide is designed to help you start to share information about your loved one with us. We will then pull the details from the guide and begin customizing your loved one’s Life Celebration.